What a great morning! I love apple picking. Love those "smile" pictures of Ashlynn! So much fun! P.S. I love the title of your post lol! Fun!! What a beautiful day for the activity. Love that little braid..!! :) How were the apple cider donuts? Sounds delish.. I can't wait to take Rae to the apple farm! She's big into "pples" lately! I'm thinking I should throw Ellie in her wagon and walk her over to our neighbors to pick more apples! We are going to the pumpkin patch again this year and can't wait to see how much fun Ellie will have!!! So cute!! We're trying to go this weekend. Oh and I can soooo understand this: "before football took over my husband's life." every.weekend. I swear I curse his fantasy and hope he loses all the early games so he gets all mad and loses interest. Its the only reason he watches every damn game. I think they should do more red carpet coverage to make up for the football we have to watch, emmy's, gg, sag, and oscars aren't enough. A was 18m last year at the pumpkin patch and it was a blast, watching her wonder around. Of course, I'm sure she'll love it even more this year since she'll understand a bit more. Love that these traditions continue to build. Haha, it's one of her favorite books! You know, I never really thought about it, but you're right! Apple trees are smaller than you would think. 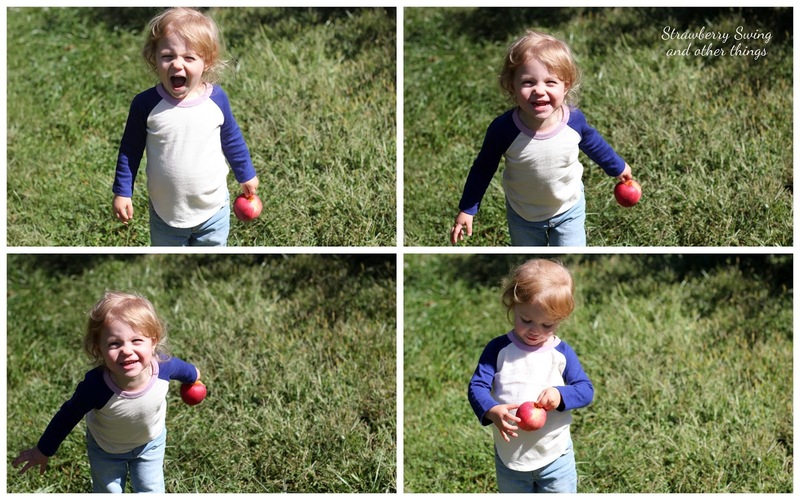 Mason could walk right up to some (not all but a good amount) and pick his own apples too. How funny. You do always think that you will need a long pole to pick apples off tall trees! So glad you guys were able to go and had such a good time!